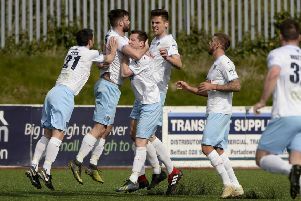 First half strikes from Adam Lecky and Andy McGrory saw Ballymena moved to the summit of the league table after they were made to work hard by ten-man Newry City last night for a 2-1 victory. It was the home side who dominated the opening half hour of the game and they looked the most likely to score in the first period. After Stephen Hughes’s cross-come-shot had been held by Ballymena keeper Thomas McDermott in the tenth minute, City went even closer three minutes later when Thomas McCann played a one-two with Declan Carville outside the box before curling an effort just over the crossbar from 20 yards with McDermott rooted to his line. Darren King then fired his diving header from a Dale Montgomery free-kick wide of the post on the quarter hour as Newry continued to have the better of the possession and territory without putting McDermott under enough pressure. Despite their continued dominance, City went behind nine minutes before the break with a Ballymena goal that came totally against the run of play. Some nimble footwork from James Knowles on the edge of the area saw the midfielder superbly make space before attempting an audacious chip over Andy Coleman. The ball beat the Newry keeper but came back off the inside of the right-hand post and Adam Lecky was on hand to sidefoot the rebound into the empty net from point blank range. The Braidmen then doubled their lead a minute before the break when Reece Glendinning’s excellent low cross from the right saw Andy McGrory power into the box to crash home a fine right foot volley from 12 yards that gave Coleman no chance. As the tie entered stoppage time in the first half, there was a set to involving most of the players on the pitch just outside the Ballymena box that result in yellow cards for Newry’s Mark Hughes and Carville, while Lecky was also booked for the visitors. Newry thought they had pulled one back just before the whistle when Mark Hughes’ corner from the right was headed home by Daran Noonan, but Referee Evan Boyce had already blow his whistle for a free out for apparent blocking. Newry were then deal a serious blow on the hour mark when an off the ball incident saw Coleman shown a straight red card after he and Cathair Friel clashed in the Newry box. Replacement keeper Steven Maguire was called into action soon after coming on for Stephen Teggart, keeping out shots from Friel and McGrory in quick succession as Ballymena looked to finish the game off completely. But it was City who scored next on 68 minutes when Mark Hughes’ cross from the left wasn’t properly cleared by the visiting defence and Dale Montgomery was on hand to lash the ball high into the top left hand corner from 15 yards.